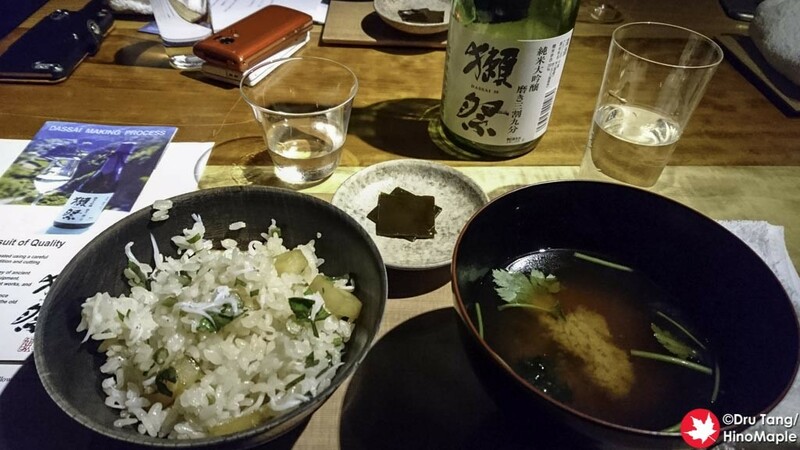 I went to Kafuka because I was attending an event for Dassai sake. I was really excited to go and couldn’t wait to try their food and I was really happy with what I was able to eat. 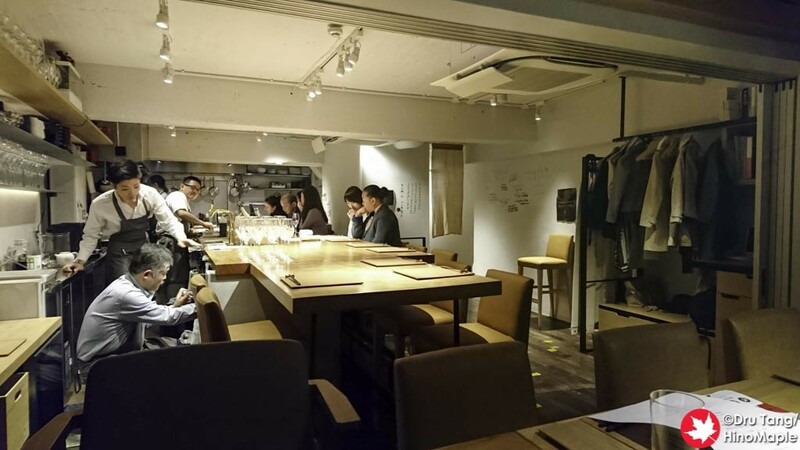 The place is really nice inside and you will definitely be able to impress your clients or date if you ever wanted to have a nice dinner in Azabu Juban. Getting to Kafuka is pretty difficult. The directions are not difficult to follow but it is difficult to find the place. It is a couple blocks off of the main street and it is on a very small side street. When I went there, I made sure I knew where to go and by the images of the food website Tabelog, it was supposed to be easy to find. The only problem is that the entire place was dark. There were no lights to help you find the place and all of the signs were really dark. It is like going to a secret restaurant but it wasn’t that secret because the main dining area has windows to outside. 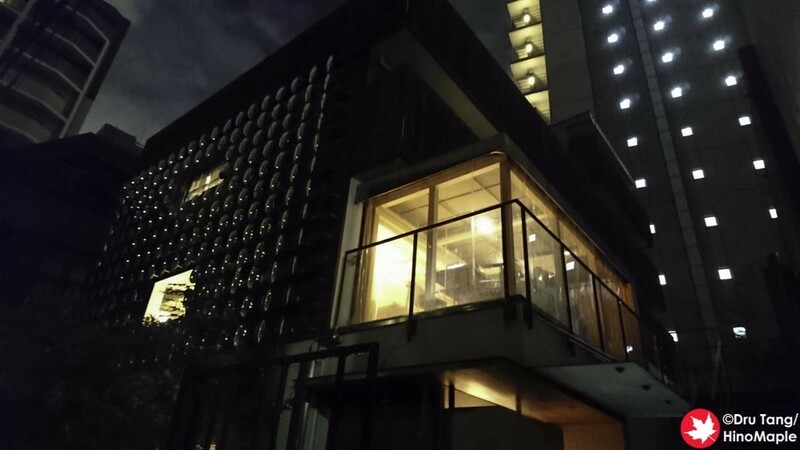 Kafuka is located on the 2nd floor of the building and the entrance is just a simple wooden sliding door. It was really beautiful but without any signs lit up saying it was Kafuka, it was a little difficult to find. The decor inside was really nice too with a lot of natural light coloured woods and white walls. It was a really good place to be, but if you are hoping for something more down to earth, this probably isn’t the place to be. I would definitely take a date to this place as the food is really good. 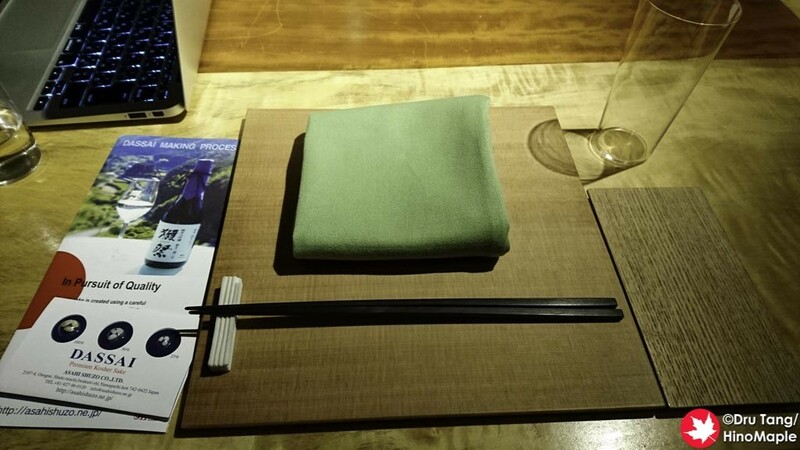 The dinner course that I had at Kafuka was not the typical dinner course that they have. It was a specially designed menu for the Dassai event so I cannot really comment on the regular menu, but based on the food that I got, it was still of good quality. 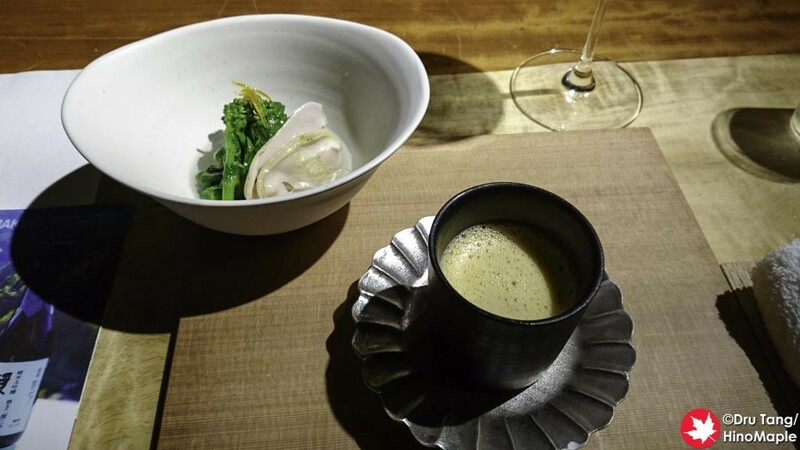 The dinner started with a small bisque made with blue swimmer crab next to some mixed bitter vegetables with a steamed surf clam seasoned with a little wasabi oil. The bisque was nice and piping hot and the surf clam was delicious. The bisque was not as heavy as I expected and the surf clam had a good light hint of wasabi which really complimented it well. The next dish was sashimi with a kombu dressing. It was a nice carpaccio style dish that was really paired well with the Dassai sake. The lightness of the Dassai Beyond and the delicate flavours of the sashimi really went well together. The next dish is something that a lot of people don’t really like to eat as it was fugu. I had never had cooked fugu and for this course we had deep fried fugu with mountain vegetables. Everything was served in a very light broth and even though the fugu was sitting in the broth for a few minutes, it remained crispy the entire time. 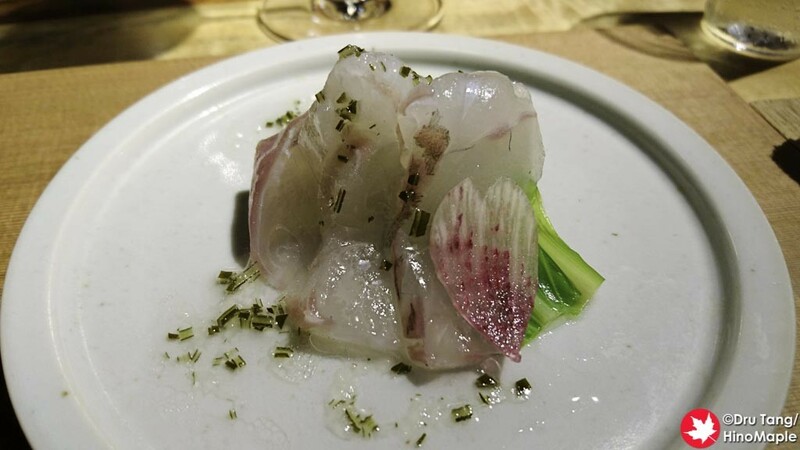 It is probably a very difficult dish to make as the fugu has a very delicate flavour that is hard to notice and the oil could have overpowered it. Thankfully this was not the case and I loved every bit of this dish. 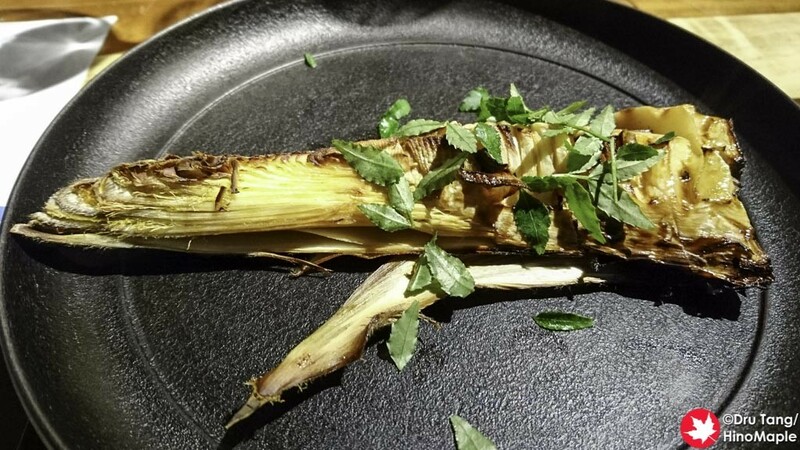 One of my favourite dishes of the evening was the roasted bamboo shoot with sansho leaf. Sansho is one of my favourite spices in Japan and bamboo is also very delicious. I am often used to small bamboo shoots, or having it cut very thinly. 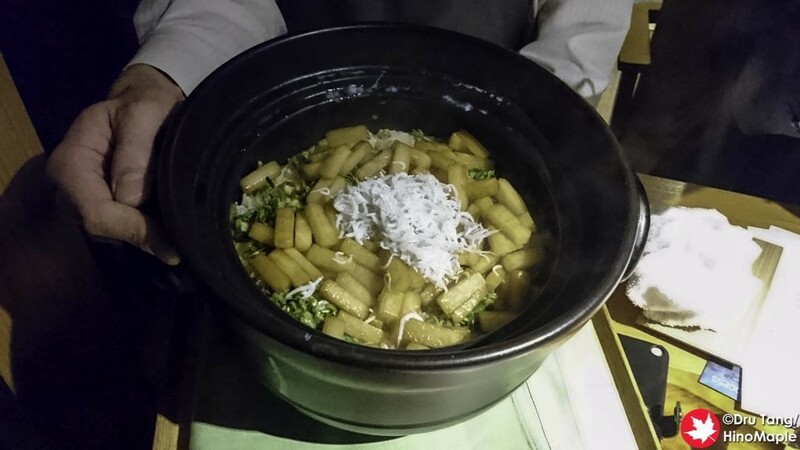 This bamboo shoot was much bigger and when they were cooking it, it made the entire restaurant smokey. The dish was really simple but really delicious. 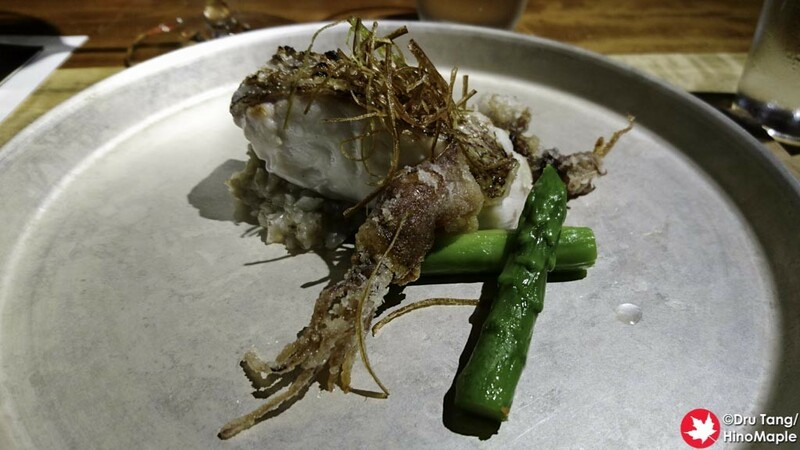 The next dish was char grilled snapper with green asparagus and firefly squid. I don’t really remember this dish because the bamboo shoot was really good and the main course that followed was also really good. 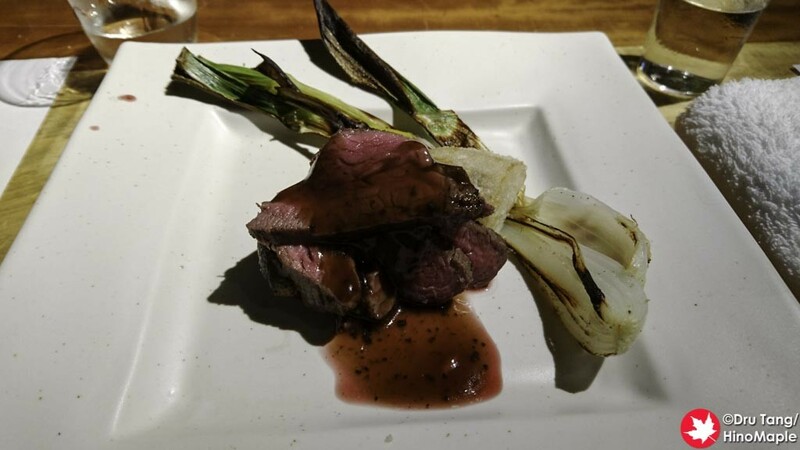 The main course was grilled tankaku wagyu eye-fillet with a small piece of taro, heirloom onion, and yellow beetroot. The seared steak that was cut very thinly was very tender and juicy and it just melted in your mouth. The vegetables were also really good and cooked to perfection. Everyone was commenting on how good it was and I agreed. The centrepiece dish was the donabe rice dish. Donabe is just a large heavy pot that is used to cook rice in a traditional way. It was daikon rice with whitebait on top. It was a simple rice dish to finish things off and it was a nice way to make sure our stomachs were filled to the brim. 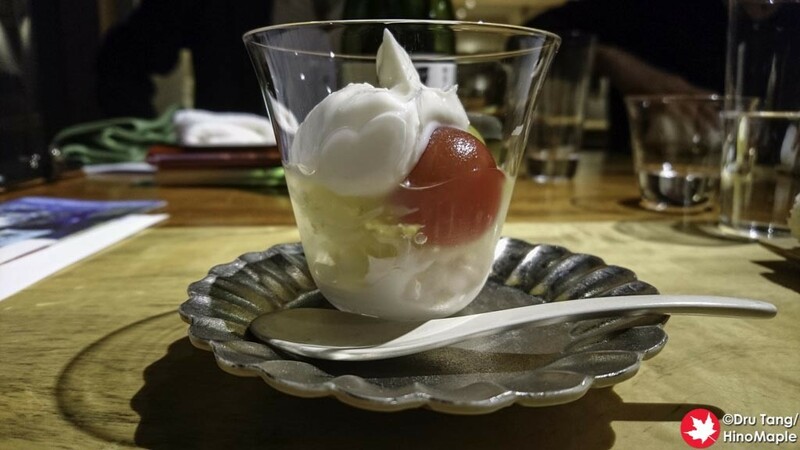 For dessert, we had a dessert pomero and a cherry tomato, mixed with sake lees cream that looked like a parfait. I’m not a big fan of tomatoes but this dish was still good. Sake lees are the by-product of producing sake. After pressing all of the sake out of the rice mixture, the left over rice is called “かす” (kasu) in Japanese and that can be used to make everything from Amazake to this type of dessert. The sake lees cream actually reminded me a little of yogurt and the combination with the sweet tomatoes were a good match. Overall, the dishes of Kafuka were really delicious and I was really happy to have the opportunity to visit this restaurant. It is definitely somewhere I’d bring a client or a date and it is definitely a good place to visit. It is hard to find and you’d definitely feel like you found a hidden gem if you visit Kafuka. I wish I could say that I would be back again but in reality I doubt I could afford coming here often, but I would definitely like to try. 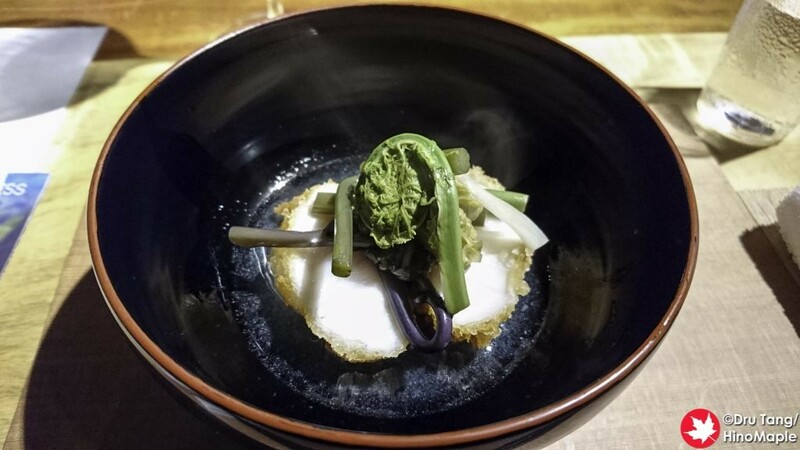 This entry was posted in Tokyo Food and tagged Azabu, Azabu-juban, Bamboo Shoot, Bisque, Donabe, japan, Kafuka, nihonshu, sake, Sake Lee, Snapper, Surf Clam, tokyo, Wagyu by Dru. Bookmark the permalink.